Last week I attended a local search conference in San Francisco and learned several new trends and ideas I’m excited to share. Mobile is everything, or soon will be, according to the experts at the Mobile Local Media conference sponsored by the BIA Kelsey Group, where Google’s head of mobile search, Surojit Chatterjee, Yelp’s director of business development, Mike Ghaffary, and executives from PayPal, Pandora and Groupon shared their insights. A post-PC world is coming. It’s when we are using our smart phones and mobile devices more frequently than our desktop computers. Surprisingly, we are getting closer and closer. As a small example, I am writing this blog post on my iPhone. The trend is fueled by a couple of stats. Last year smart phones began to outsell traditional computers and laptops. These latest generation phones are more powerful than computers were just a few years ago. Think about it. What do you use a computer for? Email, web browsing, word docs, spreadsheets and games cover most uses. Phones do all of that, and more. Thinks pictures, video, texting, GPS locating, and good old phone calls. More than 90% of mobile phone users keep their device within arm’s length 24/7. They look at their phone an average of 40 times per day. I thought I was the only one. So what does this mean for small local businesses? It means we have to change the way we are engaging with buyers and make it easier for them find us on mobile devices. Most mobile users want a few things quickly: your phone number, a list of goods and services, directions to your business, or a map. Mobile local search is up 117% year over year. It’s on a dramatic curve that will continue to grow, as mobile devices get even smarter. Already, 50% of local searches are on smart phones. The first step is optimizing your web presence by updating your Google+ Local listing and the top directories for your business. This will create good mobile interfaces for locals searching for the goods and services you provide in a specific town or zip code. We provide a service called Local Search Optimization and it’s shown excellent results in providing a mobile friendly interface and helping our clients rank higher on searches. The next step is having a mobile website. This way, customers searching for you on their phone have easy access your business information. If you’ve ever pulled out your phone and tried to navigate a full-sized website, you know the frustration of pinching and zooming your phone trying to find what you need. Without a mobile site, you will lose customers. More than 40% of mobile users say they would visit a competitor’s site due to a disappointing mobile experience. QR codes are another way you can engage your customers with a mobile device. Check out our blog post on QR codes here. 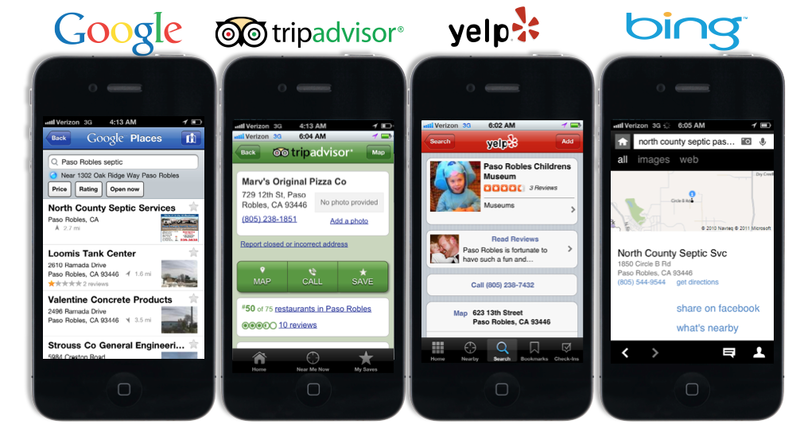 If you would like more information on a mobile website, give us a call at (805) 226-9890. Scott Brennan, owner of Access Publishing, has a Master’s Certification in Advanced Internet Marketing from the University of San Francisco. This entry was posted in Local Search and tagged Google+, mobile, mobile website, search, smart phone. Bookmark the permalink. That’s a good link. Thanks, Jack. We will be offering mobile sites to clients in the next few weeks. Woohoo!